This shaft is in direct contact with the clutch and the main shaft. Keeping in mind according to the gear ratio, the speed of the counter shaft may be less that the speed of the engine. The gear ratio can be defined as the ratio of the teeth of driven gear to the teeth of the driver gear. This shaft operates the speed of the vehicle. The power is made available to the main shaft through the gears from the counter shaft. This is done in accordance with the gear ratio. 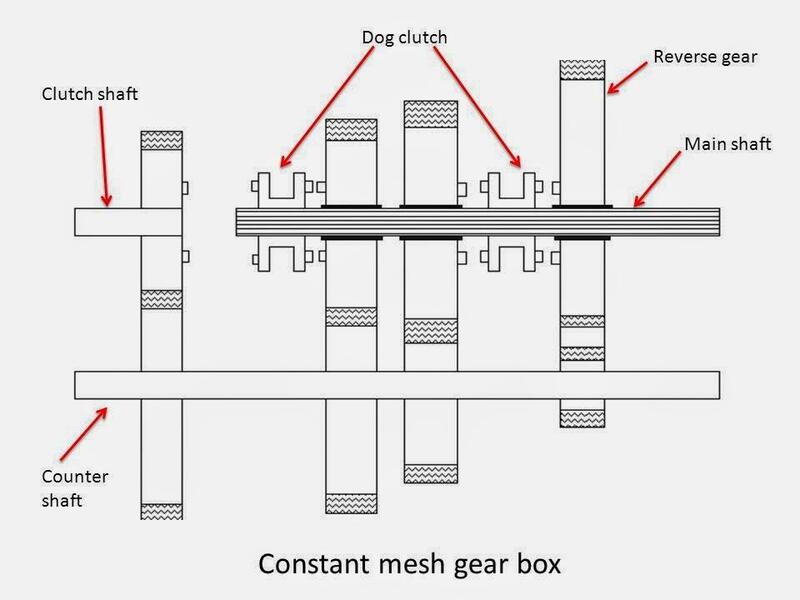 Dog clutch is special feature of constant mesh gearbox. It is used for the coupling of any two shafts. This is done by interference. Using a dog clutch, various gears can be locked to the output and input shafts. The main work of the gears is the transmission of power between the shafts. If the gear ratio is more than one, the main shaft will work at a speed that is slower than the counter shaft, and vice versa. The arrangement of both reverse, as well as forward gears, is present.